I thought it quite odd and was a little torqued because of the raspberries the editor handed out. 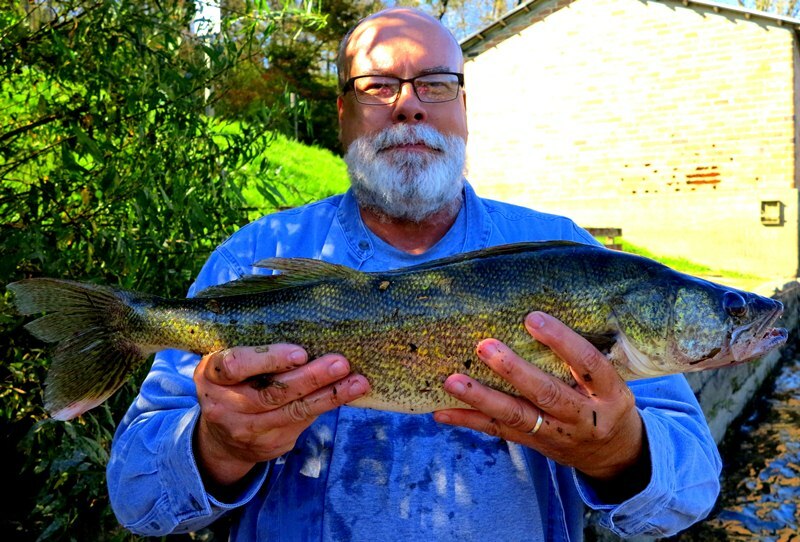 If I had a nice walleye photo and submitted to a local newspaper… I would not want someone’s name in the caption under my photo. My cousin called me the same day and told me he talked to the guy that had caught the walleye. The guy wanted that to be done in the caption. It seemed odd to me and it kinda lite my fire about catching that walleye. The guy even told my cousin the walleye was caught in a different place then the photo indicated. All of this made a trip to Cabela’s in order. I contacted Joel Ballweg. 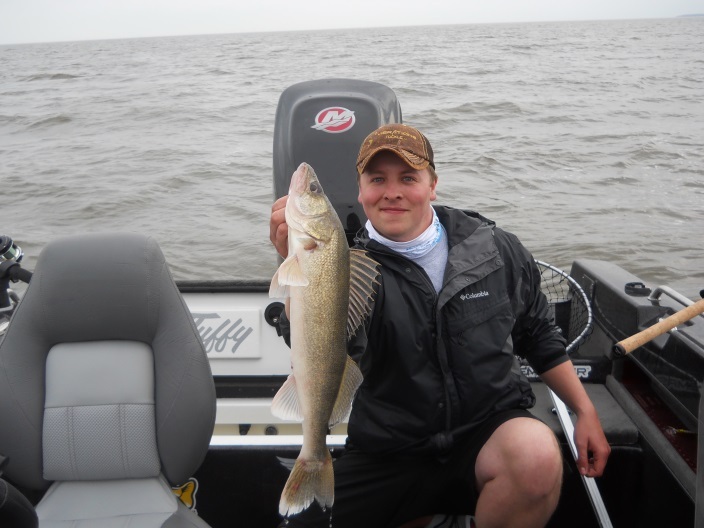 Joel is a walleye guide and I asked him what to buy for large walleye this time of the year. 100 dollars of walleye lures in my cart later I picked up a couple lures for pike. I have not caught too many walleye there so I was not expecting much success. I loaded two rigs in the vehicle. I set up my trout rod exactly the way Joel had his rod/reel when I fished with him last year. I thought I needed to have every advantage to try to catch this big walleye. I cast for 20 minutes with the walleye rig with all the lures/jigs/plastics that Joel recommended. I felt a little dejected because I am not good at walleye fishing. Pike were my species of choice after trout. Trout is closed so I picked up my pike rig and started throwing some big pike lures. The big rattle trap I purchased went on first. While at Cabela’s I saw a giant sized Rat-L-Trap in silver. I believe it is the biggest size they carry. I questioned to myself whether it may be too big for the pike in the Kickapoo River. I then remember the giant pike from the last winter I had seen. It went in the cart. This huge lure had some serious weight so I could get some really good distance with my casts. The tenth cast I had a hook up. It was way out there. At first I thought I had a decent sized trout on because of the head shakes it was doing. I smiled to myself and thought this must be a really stupid trout to hit such a big lure and trout was closed too. It quit head shaking and did some power runs and then came screaming right at shore. It got right in front of me and hunkered down and wouldn’t come off the bottom. I said out loud: “Could I have hooked that big walleye from the paper?” I quickly dismissed that because no smart huge walleye would hit a massive Rat-L-Trap. When I emailed Joel he told me large lures in fall. Most of the lures I purchased were just what Joel recommended. 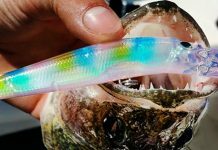 This lure I had on was beyond large. I thought maybe I had snagged a carp or trout. Then I remember the head shakes I felt. I knew it was a good hook up due to the head shakes. These thoughts were racing through my mind in an instant. I wanted to see what was on the line. I put a little more pressure on the fish to get it to the surface. I saw what I thought was a tail with a white spot on it. Oh shoot!! I had that big walleye on and I had just horsed it to the surface and it was barely hooked. I toned down my battle attack so it would tire and not throw the hook. After some gentle give and take the fat walleye slid in to the net. The net caught the lure and out it popped. The walleye was in the net. I looked at this fat pig walleye and was a little disappointed at its size. 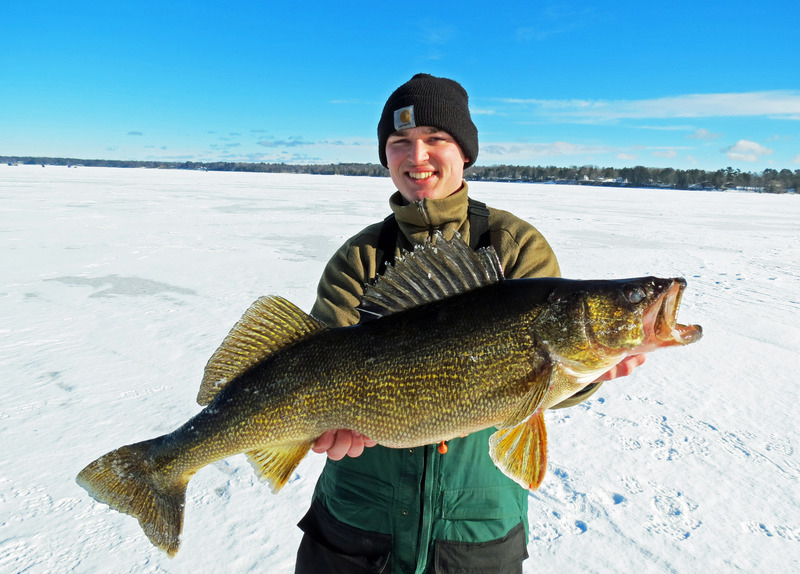 The stories that had circulated around town and the newspaper account listed the walleye at 34 inches. It was not 34 inches, but it was the second biggest walleye I had ever caught in my life. I had my camera there and took a couple photos of the fish in my net. The photos didn’t do the walleye justice. I looked around and no one else was on the water. I decided I was going to take a couple photos as good as I could. I was kneeling to take the walleye out of the net for photos when I heard a voice yell at me. I looked up on the bridge and there was my wife coming to see what I was doing. My photographer had arrived just at the right time. The planets had aligned perfectly today. Huge walleye on a massive pike lure that was barely hooked and the wife showed up on cue to take photos. I matched my photos of the eye with the one in the paper. Both had the same tear in the back fin. It was the exact same walleye.